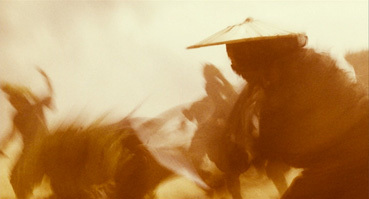 I have to admit that I came to Ashes of Time Redux [Dung che sai duk], a restoration and re-edit by Wong Kar-wai of his 1994 second feature, hampered by the flipside of the advantage I had with Francis Coppola's own particular Redux a few years back. When presented with the new cut of Apocalypse Now, I had enough viewings of the original version under my belt to be able to spot even a single altered edit or substituted line. Ashes of Time, however, I've seen only once in its original cut, several years ago and in a state of extreme tiredness. It left intrigued but more than a little confused. Its story and structure required the sort of concentration I was unable to give at the late hour of the screening and in the state I was in. For reasons I cannot offer up as excuses, I never got around to a second viewing. I'm thus in no real position to provide first-hand information on the differences between this new cut and the previous one, or rather ones, as there have been a number or re-edits in circulation over the years, most of which Wong has had nothing to do with. Ashes of Time Redux is thus both a restoration of a work that had fallen into disrepair and an attempt to provide a definitive cut of the film. Research suggests that I wasn't alone in my tired confusion and that even some of the film's long-time supporters have admitted to being left a little lost by aspects of the original cut, whose time-hopping structure added a further layer of complexity to an already intricate and multi-charactered plot. One thing that has been noted about the Redux version is that it clarifies elements that some found cloudy in the original. You'll stil need to pay close attention, but you should now have no problem putting the pieces together by the film's end. One problem that has always dogged Ashes of Time is that of pre-viewing perception, especially for an audience now more familiar with the pleasures of the wuxia sub-genre. 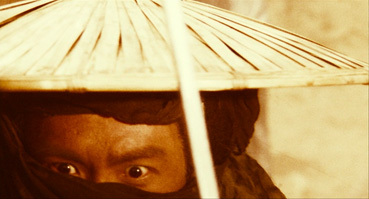 The cover of Artificial Eye's DVD and Blu-ray release encourages this reading, its image of a sword-lunging warrior suggesting a stylised action movie in the mode of Hero or Crouching Tiger, Hidden Dragon. Expectations are likely to be further shaped by the knowledge that legendary martial arts actor and director Sammo Hung was responsible for the fight choreography. But while the battles are here, they are neither as lengthy or as frequent as genre convention has led us to expect and are presented in a manner that effectively strips them of many of their traditional pleasures. Indeed, an unflattering but essentially accurate description of the film might be that it is constructed of a series of conversations intermittently punctuated by short bursts of action. So to really appreciate what makes Ashes of Time the special film it is, it's important to know that despite its wuxia literary origins, this is not primarily an action film and that the fighting that does occur functions purely to serve the story and not as spectacle. Still with me? Good. The story takes place somehere in China's mythic past and the central character is Oyang Feng (Leslie Cheung), who specialises in providing assassins for hire. Early on he's visited at his isolated desert shack by an old acquaintance, Huang Yaoyishi (Tony Leung Ka Fei), who brings with him a wine designed to help a man forget his past and procedes to quietly get drunk on it. Oyang reasons that this is probably due to a woman, and the story Huang relates, one one involving a girl and a broken friendship, suggests he's probably right. Mind you, Huang does tend to create problems for himself where women are concerned. When he woos the wife of a near-blind swordsman (Tony Leung Chiu Wai) the man vows to kill him, and when he romances and then dumps Murong Yin (Brigette Lin), her androgynous brother Yang (also Brigette Lin) makes a similar pledge and attempts to hire Oyang to do the job. But Yang and Yin are actually two sides of the same person and appear split between their love for Huang and their anger at his betrayal. Now if you're finding any of this at all confusing then you don't know the half of it. We're still at the early stages of a story in which more characters will come and go and/or be killed, sometimes without being identified by name. Such density is not surprising given that the story here is compressed from an epic three-part wuxia novel (The Eagle-Shooting Heroes by Jin Yong), but this can make it a little ticky for a western audience not familiar with the original work to keep close tabs on characters and the paths they walk. That the tale is told in non-linear fashion doesn't exactly aid initial clarity, but does prove essential to the manner in which the narrative unfolds and concludes. There are also a few viewpoint shifts (a device also employed in Wong's next feature Chungking Express), and recognising voices can be key to keeping track of whose narration you're listening to at any one moment. Much of the story's complexity stems from a single element which, much like the short-term memory loss of Momento, tends to shape events through how they are perceived by the lead characters. The catalyst for potential confusion here is Huang's enchanted wine, a liquid that enables its drinker to forget the past but whose introduction is offhand enough for viewers to assume the claim is metaphorical – after all, drinking to forget your troubles is an old and common concept. But you need to take it literally here or you're going to spend the next hour wondering why characters fail to recognise each other when they meet up again, or assuming that the actors are playing multiple roles. Ashes of Time took over a year to complete and all but emptied the coffers of Wong's newly formed Jet Tone Productions, but still has a surprisingly low-budget indie look. 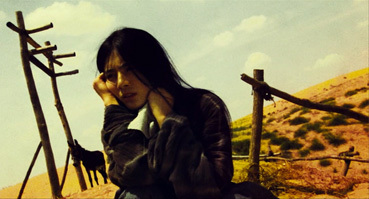 Much of what takes place involves two-character conversations, often captured in mid-shot or facial close-up, while Christopher Doyle's sometimes arresting cinematography noticeably varies in sharpness and grain level, the result of having to push the film speed when shooting scenes under inadequate lighting. 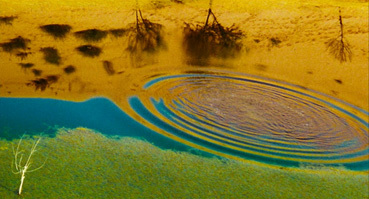 Colours are often altered and heavily tinted, the result of what looks like some serious post-production grading work, although Doyle claims in his accompanying interview that much of this was done in-camera. The fights, meanwhile, are often a blur, step-printed imagery that captures the flavour and energy of what takes place but few of the specifics – if you're tuning in for the action you're likely to be a little disappointed. So given the above, just why does Ashes of Time exert such a grip and ultimately prove so rewarding? A lot is down to that old favourite of the story and its telling. The pull may be gradual, but the characters and identity uncertainties provide plenty of first act intrigue, and the slow-reveal nature of the unfolding narrative proves immensely satisfying. Structured around chapters named after the four seasons, the story gives the impression of moving slowly but actually trots along at a surprising lick – as the final scene approached, I genuinely wondered where the time had gone. The handling bristles with unusual but often striking camera angles and inventive touches, a personal favourite being the decision to subjectively represent the temporary loss of the swordsman's sight not by dulling the image but by muffling the soundtrack, a bold move that shouldn't really work but does. About the colourisation of the image I'm slightly less certain, its effectiveness in giving the story a mythical feel balanced at times by a nagging suspicion that slightly less hallucinageic imagery might actually have been even more arresting. Ultimately it matters not, as the colouring and even the variable film grain are as much a part of the film's identity as its fine cast as its gripping storytelling technique, and once seen it's hard to imagine the film without them. Ashes of Time is a compelling early work from one of Hong Kong's most important and influential modern filmmakers, a sometimes striking melding of art-house and genre sensibilities that's probably the most visually poetic and literary wuxia film I've so far seen. From what I can remember it has actually benefited from the re-edit (and that's something I rarely admit to), although I'm not familiar enough with the original cut to comment on how the haunting new score (created by Roel A. García in conjunction with original composer Frankie Chan) compares with the old. The restoration of the picture and reconstruction of the soundtrack, however, are definitely cause for celebration. I have to admit to being a little surprised by Artificial Eye's choices for their first Blu-ray titles. I've no problems with the films themselves, but with the exception of Hidden, which was shot on HD and which I've yet to see on Blu-ray, the company appear to have gone not for titles whose visual splendour or pin-sharp cinematography would be further enhanced by the format, but ones that look only marginally better than their upscaled DVD equivalent. Such is once again the case with Ashes of Time, a film whose stylistically degraded picture and variable sharpness levels at times look almost identical on both formats. Intermittently there are shots that demonstrate Blu-ray's pictorial superiority – a big close-up of Oyang's eyes about 35 minutes in is a good example, where the skin and hair detail are noticeably crisper than on the softer DVD image. The colours on the Blu-ray disc also feel a little stronger, while the image at its best is a tad brighter and more vibrant. But given the nature of the original image, you're not going to be disappointed with either disc – the picture on both is clean and stable, the colours solid and the contrast well balanced, at least when it's designed to be. The framing actually varies from 1.78:1 to 1.85:1 and back, doubtless the result of the resotoration work. The DVD is, of course, anamorphic. As far as I'm aware the film was originally released with a mono soundtrack, but one that was discovered to be in tatters when the restoration process was first instigated and sound has thus undergone a full surround remix for this re-release. The 5.1 soundtrack on both the DVD and Blu-ray discs manages to be impressive without dominating or feeling divorced from the unaltered imagery, the placement of instruments in the score putting you in the centre of the performance and providing some walloping bass on the larger drums. Sound effects are also very direction specific, from a bird that flies between the rear speakers to subtler background sounds of wind and surf. Clarity is very good and the soundtrack itself clean, while the thundering of galloping hooves kicks the subwoofer to life. A Dolby 2.0 stereo track is provided the DVD and is also clear and well mixed, but the surround track definitely has the upper hand. The Blu-ray disc also has a DTS HD Master Audio track that I'd love to be able to report on the quality of, but my HD amp is still a few hard months of work away from being purchased. The extra features are identical on both the DVD and Blu-ray discs. All are in standard definition on the Blu-ray. The Trailer (2:07) tends to go with the trend of pushing the film as a fast paced action movie. A calmer than usual Doyle (well, calmer than he usually comes across in interviews) talks about the film's cinematography (well, duh), how he first hooked up with Wong Kar-wai, his on-set working relationships (he only works with people he is already friends with), the grading of the image (or not, it is suggested) and the challenge of shooting a martial arts film, amongst other things. As ever, Doyle is consistently interesting and throws in a few unexpected comments, describing the film as an ecological work ("If Al Gore saw this film he would love it") and suggesting the process of creating a film is "almost as liberating as beer." Like most of the interviews here, this was shot at Cannes against a background of sea and passing beach walkers. Another Cannes interview (at the same location) has the easy-going Leung providing brief but interesting answers to the expected questions about the shoot, his character and working with Wong Kar-wai. Leung and Wong have apparently known each other long enough now to rarely even talk to each other on set, while to help him define his character the director simply played him Private Investigations by Dire Straits. Leung intriguingly claims that he never saw a completed script and would just get the work for the day outlined on a bit of paper, something that's challenged by Charlie Young in the following interview. Same location and similar questions for Young, who at the time was a student and playing her first movie role. She recalls her first meeting with Wong, the experience of the shoot and discusses her character. Unlike Leung, she claims to have had a script from the start. Same location again and the only interview not conducted in English, Lau talks about her selection for the film, working with Wong and interpreting the role of Peach Blossom. She credits Wong with teaching her to act with her entire body rather than just her voice. Cannes again but a change of background and different questions. Wong talks about reworking the film, the problems with damaged and destroyed elements, the unapproved versions, the Cannes screening and the fact that this remains the most complex story he has yet told on film. A sort of EPK for the release of the Redux version made up largely from bits of the above, plus some interview material with Sammo Hung. How you'll react to this revised cut with its new score and soundtrack may well depend on your relationship with the original version, but on its own merits it really delivers, a complex and hauntingly realised wuxia story whose threads connect in unexpected and satisfying manner. The action may be stylised and break with tradition in its presentation, but its energy and purpose is still clear. Artificial Eye have delivered an excellent DVD here, which can be bought separately or as part of their simultaneously released three-disc Wong Kar-wai Collection. If you've got the cash and the equipment then the Blu-ray does just have the edge, although for much of the film you might be surprised how similar they look. Either way, highly recommended.